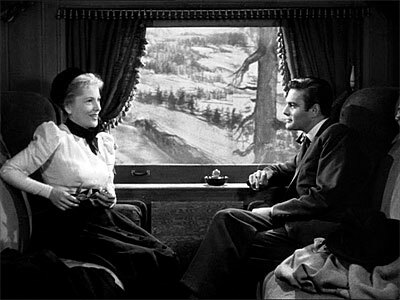 This entry was posted on August 2, 2008 at 11:10 am and is filed under FILM with tags Howard Koch, Joan Fontaine, John Houseman, Letter from an Unknown Woman, Louis Jourdan, Max Ophuls. You can follow any responses to this entry through the RSS 2.0 feed. You can leave a response, or trackback from your own site. Thanks for the discs, Mr. C! To have supplied a subtitled copy of NOIROIT was the greatest surprise of all!! Already watched the superb HUMAN DESIRE last night and THE INVISIBLE MAN this morning… but Chahine’s DESTINY also arrived today, so I must now say a proper farewell. Ahh, memories of Joan Fontaine: our September Affair was discovered by jealous neighbour, Ivanhoe, and I was unfairly labeled a Bigamist and she a Blond Cheat, but seriously, at the time, I did not care! I was a Man Who Found Himself and had discovered that You Can’t Beat Love. She Had a Certain Smile, you know, Something To Live For, but her ex kept calling and screaming down the phone, “Darling! How Could You”. Enough was enough, I was Born to Be Bad and my motto has always had a Charles Manson ring to it, “You Gotta Stay Happy”, so after his murder, I asked Joan to Kiss The Blood Off My Hands (to alleviate Suspicion), and make a promise that From This Day Forward, we would forever hide ourselves away in Dark Mansions. I miss her now though, that Constant Nymph. I love this Damsel in Distress Beyond a Reasonable Doubt. There are No More Ladies like her. The Women today fall into the categories of either The Constant Nymph, Blond Cheat, or Sky Giant (and who wants a Sky Giant???) I may be a Man Of Conquest but I can’t get interested in The Affairs of Susan, Ivy, Rebecca or Jane Ayre, and I won’t Serenade Gunga Din either. It’s A Million To One that I’m up Frenchman’s Creek without a paddle. Have you actually seen Blonde Cheat? It’s musical finale sure is one of a kind, having a HUGE coffepot as its center. No, my musical Joan experience is limited to Damsel in Distress, where, such is her charm, she gets away with not being able to dance – even while co-starring with Fred Astaire. Think of the poor guy who has to cycle the scenery while she’s making her mind up!